And we mean that literally. We moved up to Baguio City, where the temperatures range from 12 to 22 degrees. Washing dishes can be freezing, and a hot shower is one of the most wonderful things in the world. It took quite some time for us to get here though. The Hubby and I had been talking for over a year about moving out of the city (technically, Baguio is a city, but it's in a province four hours away from the jungle that is Metro Manila, where he and I have spent our last 30 years), looking for ways to lead a simpler, more productive life. We also wanted the girls to experience the kind of childhood we had, where you played with neighbors on the street and you spent hours outdoors running around instead of inside glued to a screen. Things slowly started falling into place mid last year. The girls and I were getting into the groove of homeschooling, and The Hubby started working from home. Then my long-time project, my watch magazine, went into its final print issue. There was nothing tying us down to Manila. Then my aunt offered to let us rent her gorgeous house up here in Baguio--and then suddenly we were packing, and here we are. Enjoying the cooler weather on the porch. Except that it didn't go quite as smoothly as that. The house wasn't ready by the time we were planning to move, so we had to ask the old landlord for an extension. Then we weren't able to make the move in one big go, for various reasons. So we made a few trips up and down hauling stuff and kids both ways. The thing with that piecemeal style of moving is that we were neither here nor there; we were up here and we needed some stuff that were still down in Manila. And when we were in Manila, we'd discover that we already brought up something. Our final hurrah though was last week, when we really had to get out of the old house. My uncle came down with a van, and we tried to stuff as much as we could. We only started seriously packing the night before (because before that, we were preparing for the kids' portfolio presentation and assessment; and it's so hard to pack stuff when you're still using them!) and The Hubby and I didn't get any sleep. Our stove and dining table, which we gave away, was also picked up the day before, so we were uncaffeinated, eating take out on top of the cooler. After my uncle left, we still had half a house and 13 years of our life to pack! This was us on our last two days at the old house. Then the landlord's caretaker arrived, waiting for us to turn over the keys. And he waited there the whole three hours (or more) before we finally gave up and gave him the keys. Actually, we asked the landlord for a little more leeway, more time to leave our stuff in the house until we could come back for them, because there was no way everything would fit in our car. The Hubby's sister had taken a lot of stuff to keep in her house for the time being, and my brother and sister-in-law already had a couple of boxes of our stuff parked in their house, and our things seemed to be multiplying like gremlins. Really. But long story short, we traveled up fully loaded, and when we started unloading here in our new house, we realized how mindlessly we had been packing the car. 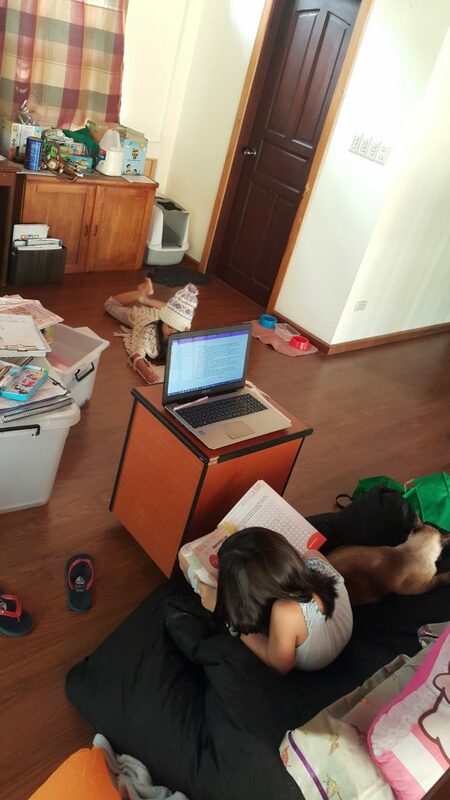 In our panic to meet the turnover deadline, and to make things fit, and most likely due to lack of sleep and too much Chicken Joy and burgers and no coffee, we went up to Baguio with stuff like a mug tree, old bedsheets, an abundance of stuffed toys, and piles and piles and piles of books. We left behind things like all the hairbrushes, nail clippers, toiletries, and you know, the essentials. So we may have bedhead forever, but hey, we won't run out of something to read as we hang up our mugs on the mug tree (because we did remember to pack our mugs!). 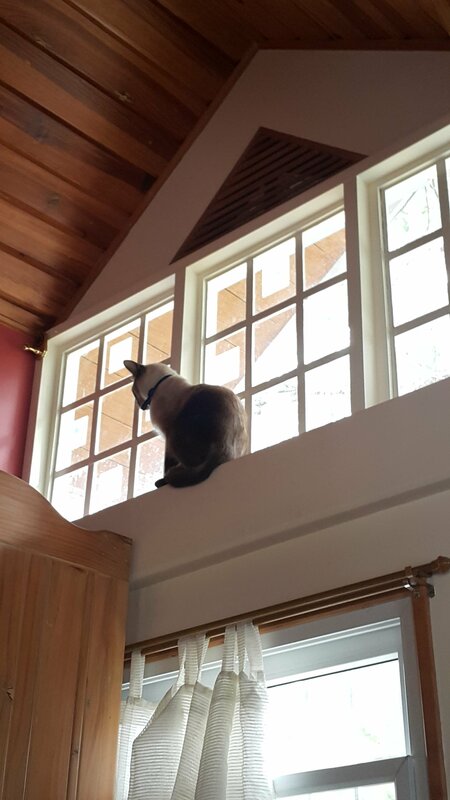 Simon on his first day--getting a birds eye view of his new domain (and he really did see birds, which is how he ended up stuck on the roof). We've been settling in over the past week, unpacking the boxes and crates and putting things away, but there's still so much to do! Mostly because we don't have bookshelves yet. Or desks for The Hubby and the girls (I fortunately have one that came with the house). And we have been out of school for half a month already, so we really do need to get back into the school/work groove. In the meantime, The Hubby works out of the living room, and the girls do work on the floor. Doing school amidst the mess. without any desks. 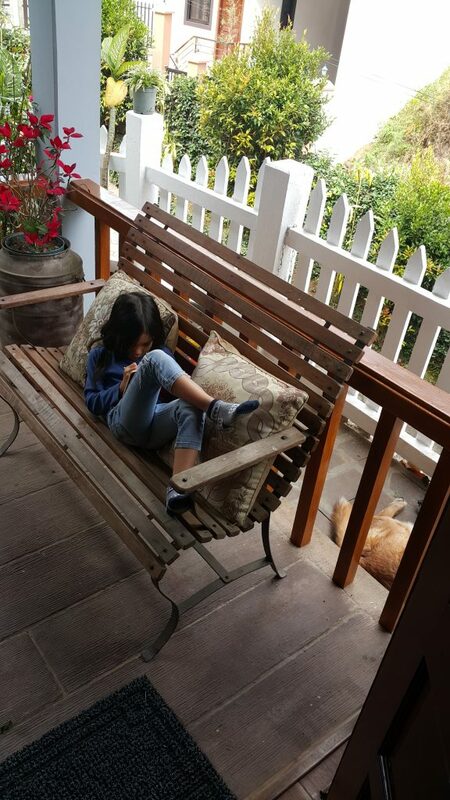 I figure it will take a few more weeks for us to get used to this new normal (because Baguio has always been associated with vacations, and it's so hard to get up when it's so cold in the morning!). But the girls are loving it here, all that space and fresh air! Plus my prayers have been answered--there are kids their age across the street who can come out and play on weekends (because they come home from school at 5PM and have homework to do--and of course I said, "Isn't it great that you're homeschooled?"). We tried our new church today, and the girls made friends. And I will hook up with my childhood BFF soon, and we hope to find a small group and make new friends. And so the HPs begin this year with a grateful hearts full of hope, and eager to live out this new beginning. To see how other homeschooling families are doing this week, click here. Moving is always hard! Hopefully you get all settled in soon.I wish you the best of luck in your new home. Wow! Sorry your move was so hectic. It looks like your new home is beautiful. And I love that picture of your cat. Cats seem to always fit in (even if they pretend the don’t like it), don’t they? Good luck getting settled. How exciting! I bet it was a lot of work but it sounds like you are all settling in well already… minus the few necessities you left behind. I can’t even imagine what it must be like to pack up years and year of living in one house; I know we accumulate a lot of stuff that we don’t often even think about as long as there is a place for it. Best of luck to you all. That view of your porch is gorgeous! Making a big change like this is always hard but can bring great blessings. Our family made a cross-country move last year – with it came many changes and we’ve had a year of transition. That means growth. It isn’t always easy, but it’s good. Hoping you feel settle in your new home soon!